In collaboration with Panasonic, Emmy award winning writer/producer, Barry Green, has created a comprehensive guide to analyse the AG-DVX200 4K camcorder, the successor of the popular DVX100 camera. This e-book not only closely examines all of the intelligent and features of the DVX200, it also contains various tutorials concerning some of the most common situations that users are faced with when using this camcorder. The book also explains the features and settings of this 4K camcorder in detail in order to specify which scenarios in which each of the features would be useful. 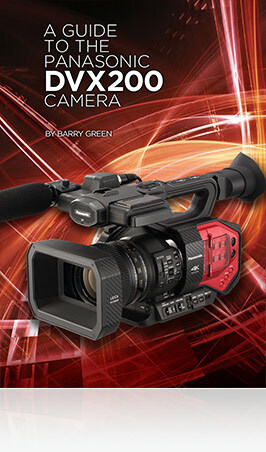 Ranging from basic to advanced topic, this guide presents an extensive study of the DVX200. To get access to your very own copy of this sought after guide, please enter your details into the form below. Please note that to download the e-book, you will be required to register for our subscription centre. Panasonic will not use your details for unsolicited marketing purposes, and all data that you give to us will be processed in accordance with the UK Data Protection Act 1998. By providing your information you are consenting to Panasonic System Communications Company Europe, contacting you with information about our products & services. For more information, please click here.